School uniforms can be pretty awful. When everyone is dressed exactly the same, it's *so* difficult to show individuality. However, depending on your school's dress code, there are tons of ways to jazz-up a boring school uniform and display your own sense of style. 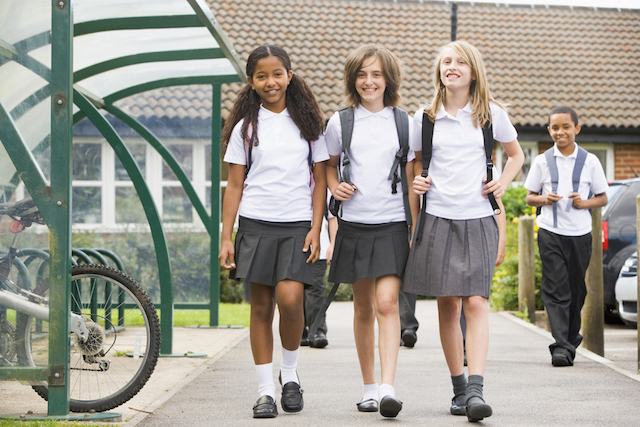 We've got six stellar tips right here to make your everyday school look your own. Since you don't have to pick out an outfit everyday, you have extra time in the morning to spend on hair and makeup. Play up your look with fun shadows and punchy lipsticks that play up your personality and make you feel more confident. You can even pull a Blair Waldorf and go for a signature accessory—in Gossip Girl, Blair's was a simple headband, but there are all kinds of hair accessories you can make your own. Layering is a great way to individualize your uniform *and* it'll help keep you warm in the cold seasons. A cute way to utilize layering is by wearing collars. A sweater with a collar makes for the perfect layer. Cardigans, vests and other forms of outerwear are also perfect for warmth and style. Bracelets, necklaces and earrings are a simple yet stylish way to add personality to your uniform. You can layer jewelry as you please and change it up as often as you'd like. A statement necklace especially can completely transform an outfit, and one of our favorite pieces of jewelry is a watch. Peep these seven adorable timepieces here for some inspo. If your school is more strict about what you can wear, show your personality through your backpack. Tie on a scarf, decorate with some cute keychains or even pop a few buttons or patches on your bag. You can find buttons and patches for just about everything—political candidates, bands, books and more! In particular, we love these book lover's buttons. A key tip to looking polished is having clothes that fit properly. Getting your uniform pieces tailored is another way to show your style. Change the length of your skirt, or maybe crop your blazer so it's more flattering. Just make sure not to violate any of the school's dress code policies when you do so. Legs cold in the winter? Try on some cute socks or tights! There are so many varieties of colors, patterns and styles that you're sure to find something you'll like. Forever 21 has a huge selection of socks and tights as well as T.J. Maxx. Do you have a school uniform? How do you make it your own?